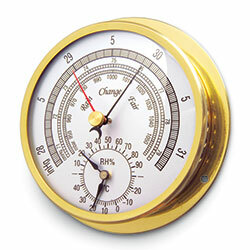 This stainless steel wall-mount unit measures barometric pressure in mbar, cm Hg and "Hg. Humidity range is 0 to 100% RH with 2% accuracy. 6" dia.